Phase I: Submit your workshops! The workshop submission site opens March 1, 2019. You, the ESS community, will have about three weeks to propose and request workshops. If you don’t already have an account, you’ll be prompted to create a username (or you can log in with Google, Yahoo, Facebook, or Twitter) to submit your idea. (Yay! Anti-spam protection!) If you’re setting up an account without logging in via Google or one of the other services, and you don’t see a confirmation email, be sure to check your spam folder. On March 25, we’ll open up voting. Go to skills.epicskillswap.org to see the workshops that were proposed during the submission period. At this point, everyone (even those who did not propose a workshop) will have an opportunity to vote on the skills you’d like to see offered at this year’s Swap. Note: this step is not a popularity contest—in the past, we have had space for everyone who proposed a workshop to teach one. We use the voting results to plan the schedule and gauge the relative interest in multiple workshops if someone proposes more than one. Voting will close March 31. 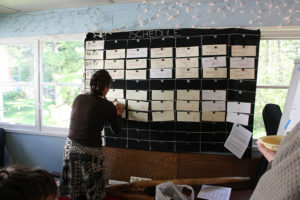 Phase III: Building the schedule! We will be in touch with workshop leaders to confirm your participation in early April. If you proposed more than one, we’ll give you a sense of which garnered more interest. The schedule will be posted in early/mid April. And then we’ll all do happy dances. There will be a few spaces left in the schedule for for folks who missed the submission process to lead workshops at each weekend.